It is time for another Blue Ribbon Challenge. Anna at Crunchy Creamy Sweet is kind enough to sponsor this challenge again this month. 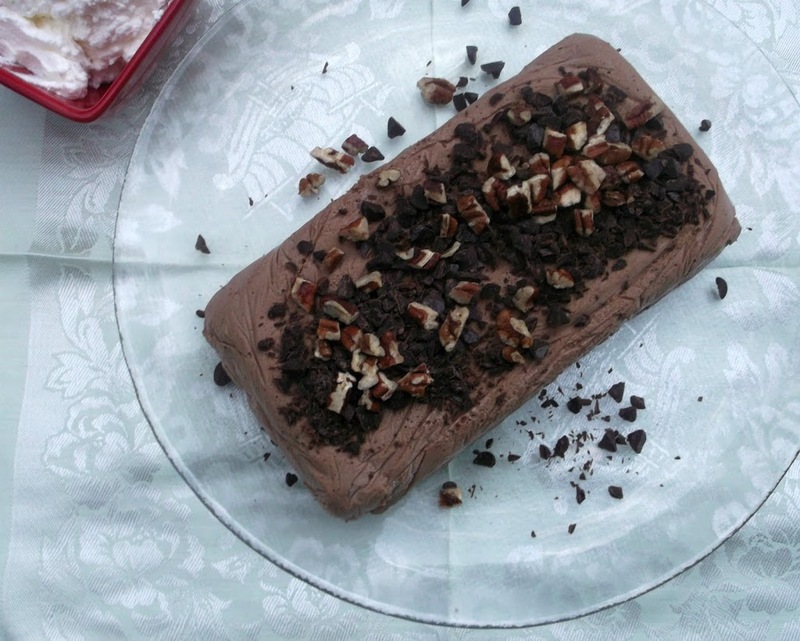 The challenge this month is to make a semifreddo. To be honest with you I had never heard of semifreddo before this. If you are like me and have never heard of a semifreddo before, I found a definition in my Joy Of Cooking cookbook: Semifreddi are frozen mousses usually made with a custard or egg base, lightened with a whipped cream, and molded in a loaf pan or individual goblets. Sounds yummy; doesn’t it! As I just stated this is the first time that I have heard of the term semifreddo, so I set out first of all to find out what I would be making and then second of all to find a recipe. I wanted something simple, because I knew that I would be making it last minute. With my father-in-law here until Sunday, I had decided to put this off until he had left. I wasn’t quite sure how long it would take to make and I didn’t want to take too much of my time making something for the blog; we were way too busy playing games and cards for that. I found a nice simple recipe in my Joy Of Cooking cookbook. The recipe was chocolate of course. It didn’t involve too many ingredients, but it was time consuming. A lot of beating that is in beating of the eggs, the egg mixture, and then the whipping cream. But by the time it was ready to put into the freezer the mixture was so fluffy and creamy, I couldn’t wait until it was frozen so that I could sample it. The dessert was supposed to freeze at least for 8 hours; the one that I made was in the freezer for almost 24 hours. I was a little worried that it would not be as good with sitting in the freezer for that long, but I was wrong. The semifreddo was creamy, sweet, and delicious. All that beating I mentioned earlier was well worth it. The dessert was a little bit of frozen chocolate heaven on a very hot day. 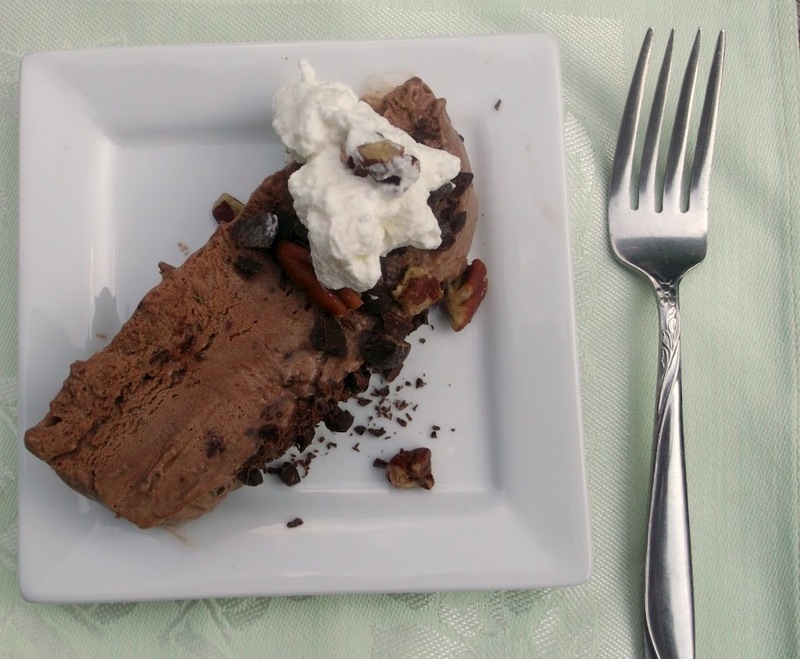 I hope that you will head over to Anna’s at Crunchy Creamy Sweet and see all the wonderful semifreddo recipes that everyone else has posted. I am sure it will a little bit of sweet heaven. Thank you Anna for sponsoring the Blue Ribbon Challenge again this month. Gently fold the cream into chocolate mixture. Pour into the prepared pan and place plastic wrap directly on the surface. Freeze until firm, at least 8 hours. Remove the plastic covering and un-mold the semifreddo onto a serving platter. Peel away plastic wrap, slice, and serve immediately. Top with chopped nuts, chocolate, or whatever tickles your fancy. Note: For a dramatic increase in flavor, substitute brandy or Frangelico for the water. I don’t have an ice cream machine so your semifreddo would be perfect. 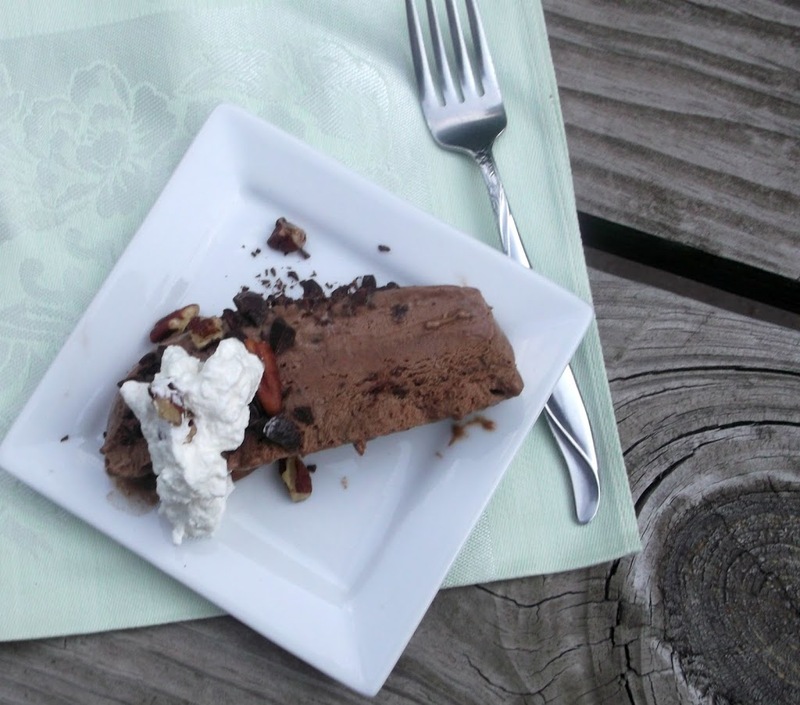 Such a coincidence – I made my first semifreddo today! I haven’t tried it yet but I hope it comes out as good as yours! This looks decadent and delicious! Thanks for your explanation of what a semifreddo is. I kinda sorta knew, but you confirmed it. It’s one of those desserts you hear about from time to time, but I’ve never tried one. This looks great! Thanks. I’ve yet to make a semifreddo myself, but you’ve inspired me. This looks delicious and so very chocolatey! Yum!